Jack and the Bean Stalk; or, Harlequin and Mother Goose at Home Again. The author is unknown, but the composer was Alfred Mellon. 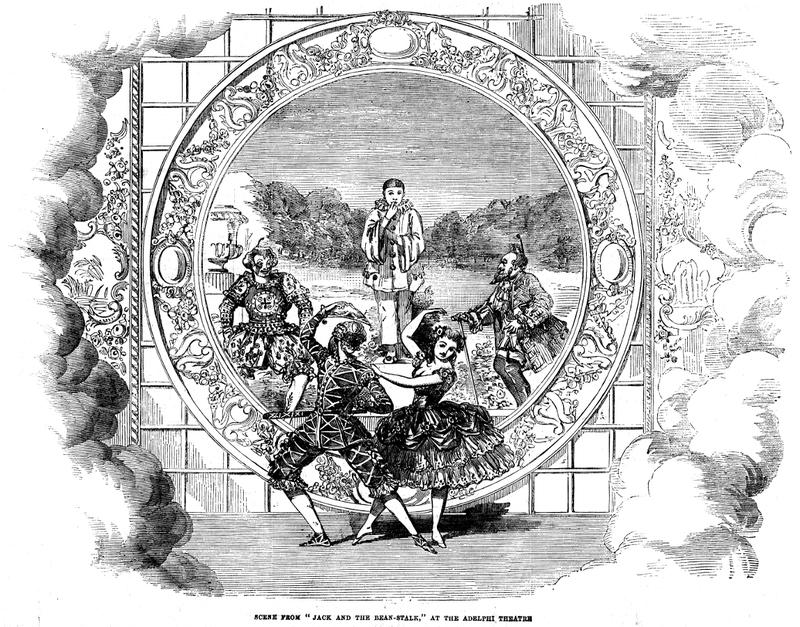 The Pantomime at this theatre is distinguished from the general character of these performances by the introduction of Madame Celeste as Harlequin, and she is a most graceful representative of the motley hero. The Columbine is played by the pretty and clever Miss Wyndham; and those playgoers who only are acquainted with these ladies in connection with their more serious histrionic delineations will be greatly surprised and gratified at witnessing their Terpsichorean efforts. The tableau selected by our artist is one of the most striking in the pantomime and represents a group, which might have been painted by Watteau. It is the most charming stage-effect we have ever seen and should of itself at once attract public attention. The Clown and Pantaloon are played by Mr. Garden and Mr. C. J. Smith--two gentlemen very favourably known to the frequenters of the Adelphi as actors of considerable merit, and who have, in conjunction with Miss Wyndham, upon this occasion gone out of their way to support their excellent directress in her new and arduous undertaking.